Nucleus is undoubtedly the controlling centre or CPU of the cell where the genetic material DNA is residing. All instructions for the working of the cell are encoded in the DNA, the master molecule of the cell. Nucleus is the largest organelle in animal cells whereas vacuole occupies much greater space than nucleus in plant cell. Prokaryotes lack nucleus as the genetic material DNA is not surrounded by nuclear membrane. It is scattered in the cytoplasm. In all bacteria, DNA is not enclosed within a membrane. The region where DNA is present is called nucleoid region. In Multicellular eukaryotes, like plants and animals, some cells lack nucleus often as an adaptation for its effective functioning. 2. 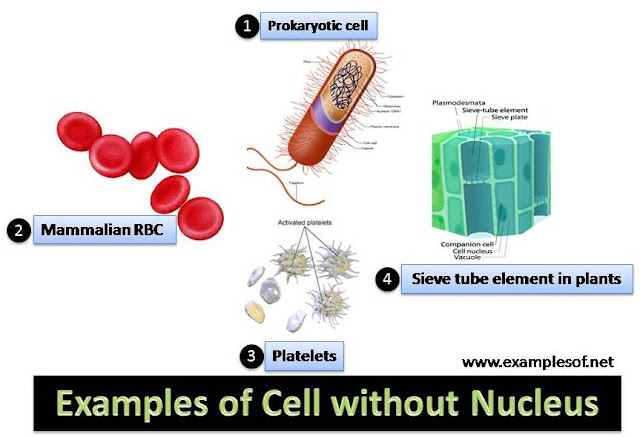 Mammalian Erythrocytes or Red blood cells or RBC is devoid of nucleus at maturity. The function of RBC is to deliver oxygen to body tissues by moving through circulatory system. The RBC is devoid of nucleus and other organelles like mitochondrion. Cytoplasm of RBC is rich in hemoglobin, the oxygen carrier molecule. RBCs must move through small capillaries and presence of nucleus and other organelles may interfere with this swift movement. Absence of nucleus and other organelles in RBC is an adaptation to carry more oxygen. Platelets are fragments of cytoplasm formed from magakaryocytes or large bone marrow cells in the bone marrow. Its function is normal blood clotting. Seive tube elements lack nucleus at maturity. Each sieve tube element is associated with one or more nucleated companion cells which actually regulates the movement of sugar through sieve tube elements. Both sieve tube element and companion cell is derived from same mother cell and is connected by fine cytoplasmic strands called plsmodesmata. Sieve tube element depends on companion cells for protein, ATP and other signaling molecules.